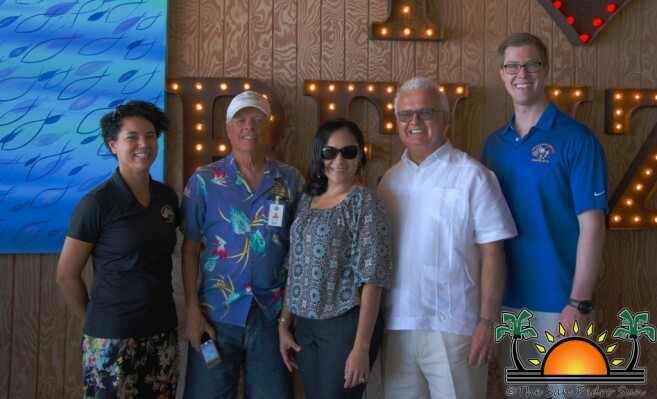 On Friday March 4th, officials of The United States Embassy from Belmopan met with various American citizens for a scheduled Town Hall meeting at the Blue Water Grill in San Pedro Town. The Embassy initiated this meeting to share beneficial information regarding consular services that it provides. Several guests, many of whom consider San Pedro as their second home, attended this informal event. Prior to the meeting, U.S. Ambassador Carlos R. Moreno gave a preliminary introduction, speaking about all national protocols the United States takes to ensure the safety and well-being of their fellow American citizens. Those who attended were reminded that the US government works in accordance with the Belizean government. Moreno also acknowledged how the Embassy is instrumental in assisting those who run into conflicts involving the law, hospitalization to those who need it, and documents that need notarization. Following the introduction, Vice Consulate Andrew Byrley proceeded with an overview of the main themes that were going to be addressed. A few of the subtopics included passport aid, voting assistance, and weather monitoring. Assistant Regional Security Officer Tim Reid Arso explained his responsibility in maintaining an investigative portfolio on Americans. He declared that as a representative of the Embassy, he tackles the surety of Americans who are visitors and others that have become permanent residents. Crime occurring in San Pedro was discussed and Reid advised citizens to secure themselves from preventable crimes, such as abstaining from roaming the streets after-hours. According to attendant John Wallace, an American realtor, he acknowledged his appreciation of the San Pedro Police Department. “I have seen a reduction in crime thanks to the neighborhood watch program. I feel as it has enormously impacted the lowering of crimes,” mentioned Wallace. After the major key points were addressed, a Q and A session immediately followed. The majority of attendees came equipped with questions, and the panel provided answers. During this segment, it was made clear that the Embassy does not provide financial assistance for the following services: funeral expenses, the cost of lawyers, property loss and/or damage and they also reject conducting door searches for persons who do not wish to be identified. The meeting concluded when the Embassy taking on the task of renewing passport applications, receiving passports, filling out voting applications, and reassuring questions. Dr. Dianne Lawrence of Quicksilver Belize told The San Pedro Sun that she finds the help of the Embassy useful and accurate. “They’ve been an amazing help on many fronts and that includes a death of a family friend, assistance with the American social security office, and so much more. They are wonderful and very helpful,” said Lawrence.